The engineers at Primo appreciate that many riders want to run open belt drives, and that includes riders who have touring bikes with floorboards where traditional open belt drives would not be compatible. To solve this issue the company makes a narrow open belt drive to fit '90 - '06 FXR and Touring models. It makes use of a high performance, heavy duty 8mm drive belt and forged 6061 aluminum pulleys. 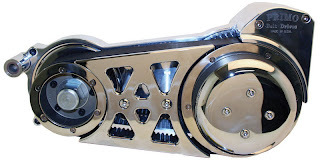 The motorplate is machined from a solid block of 6061 billet aluminum and includes the heel toe shifter shaft support, which can be unscrewed from the motorplate for applications using forward controls. The outer center guard is machined from billet aluminum stock and chromed, with the clutch beauty cover chromed too. For newer models, Primo has its Brute IV Extreme, which fits '07 and later Touring models. This open belt drive features a 3⁄8in thick billet aluminum outer guard and a Rivera Pro clutch. It also uses an 8mm drive belt (said to be capable of handling 150hp plus engine outputs) and Primo's forged 6061 aluminum pulleys. The same features and styling of the motorplate used for earlier bikes are also used on this application.